For the tree and its fruit, see Nance. 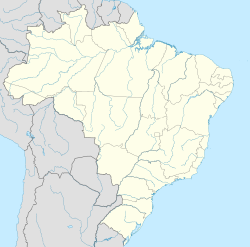 Murici is a municipality located in the west of the Brazilian state of Alagoas. Its population is 22,132 (2005) and its area is 424 km². According to the Veja magazine, despite receiving generous public transfers, the city still lags behind most municipalities in Brazil in human development. 30.6% of its inhabitants are illiterate and 65% rely on Federal funds to survive, which contribute for an HDI of just 0.58, slightly below Iraq's HDI of 0.59. The municipality contains 61% of the 6,116 hectares (15,110 acres) Murici Ecological Station, created in 2001. ^ "Censo Populacional 2010". Censo Populacional 2010. Instituto Brasileiro de Geografia e Estatística (IBGE). 29 November 2010. Retrieved 11 December 2010. ^ Jimenez, Gabriele (2013), "Parada no Tempo". Abril press, April 17th, 2013, pg. 88. This Alagoas, Brazil location article is a stub. You can help Wikipedia by expanding it. This page was last edited on 26 March 2017, at 18:09 (UTC).